Hopes of a sustained rebound in Singapore's sluggish exports were dealt a blow yesterday, as the latest data showed a return to declining shipments. Economists say this weakness might mean that Singapore is not benefiting as much as it once did from stronger global growth, as several factors, including reduced competitiveness, take their toll. 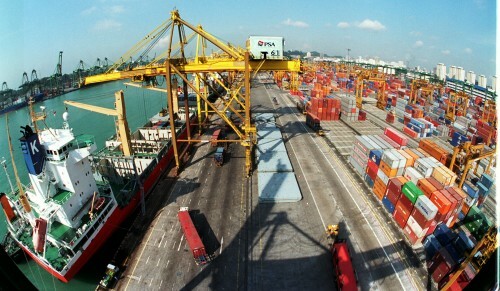 Singapore's non-oil domestic exports (Nodx) fell 8.8 per cent in November over the same month last year, disappointing analysts' expectations of a 4.3 per cent expansion. Exports from three key industries - electronics, pharmaceuticals and transport engineering - were weak, showed statistics released yesterday by trade agency IE Singapore. The Nodx rebounded unexpectedly in October, growing 2.8 per cent after falling 7.1 per cent in the first nine months of the year. Economists expected a second straight month of export growth, which would have been a more decisive sign of Singapore riding on the uptick in the global economy. But "anything that could go wrong, went wrong", said CIMB economist Song Seng Wun, adding that last month's export contraction happened despite a low base in the same month last year. Shipments of electronic goods were dragged down by a fall in exports of disk media products, parts of personal computers and integrated circuits. This was the 16th straight month of decline in the electronics Nodx. For non- electronic items, exports of structures of ships and boats saw the sharpest decline of 82.5 per cent. Pharmaceutical exports, notoriously volatile, plunged 46.9 per cent compared with the same month last year, reaching their lowest level in five years. But the sharp fall could be explained by plants being shut for annual year-end maintenance, said CIMB's Mr Song. A rebound is therefore expected this month. The weak export showing last month may mean Singapore "may not benefit as much as it used to from a global economic recovery", said Barclays economist Joey Chew. Singapore's economy might now be less responsive to growth in the US, Europe and Japan, owing to a loss of competitiveness, drags from domestic restructuring and a gradual shift of economic exposure towards Asia. Bank of America Merill Lynch economist Chua Hak Bin said Singapore is underperforming compared with other regional exporters. Exports improved last month for China and Taiwan and remained positive for South Korea. The divergence is also clear when comparing Nodx readings with Singapore's non-oil re- exports. These grew by 11.2 per cent last month and rose 9.7 per cent in January to November compared with the same period last year. "Asian trade activity is gaining strength but Singapore's exports, particularly tech, are losing market share," said Dr Chua.